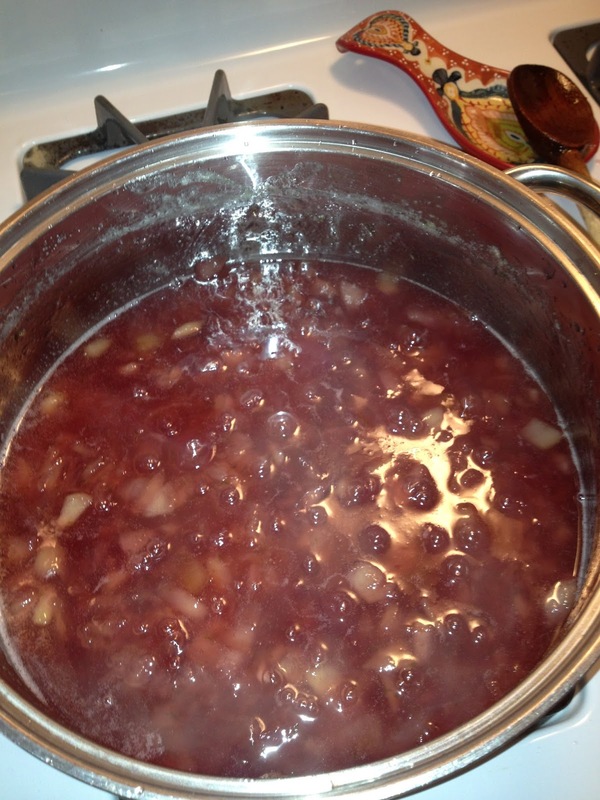 Cranberry Corner: The Jam is Done! 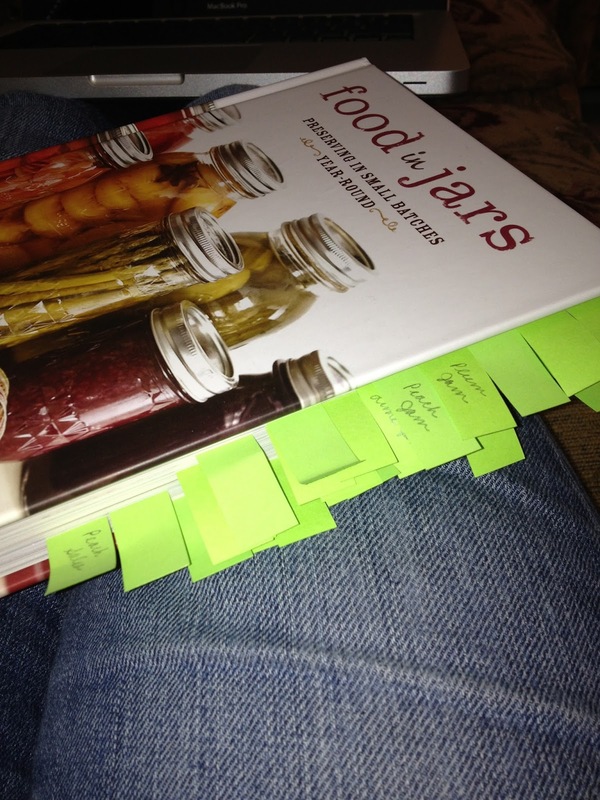 My favorite new canning cookbook is Food in Jars, which you see above, tabbed to the hilt. I love the unique flavors, and I love that each recipe makes a small batch, so you can try lots of different flavors and not be bogged down with too much of anything. I heard about this canning book from Marisa's blog of the same name, which I've been reading for about a year. I accidentally bought two copies of the book from Amazon and gave one to my friend, Luisa, who also had delicious results. It was from this book that I made two of my new favorite jams, Nectarine-Lime and Cantaloupe-Vanilla. Amazing. If you want some more resources, I also love the Ball Complete Book of Home Preserving; The Joy of Jams, Jellies, and Other Sweet Preserves (I got the Strawberry-Orange and Mango-Lime recipes from this book); Jam On: The Craft of Canning Fruit; and Canning for a New Generation. 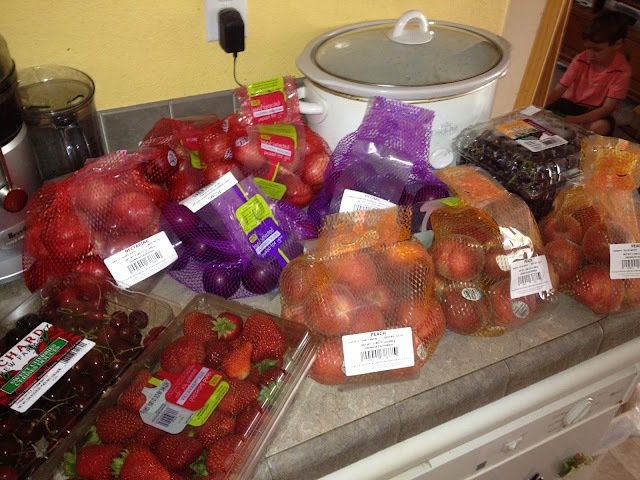 Every week I watched the grocery store ads for low prices on in-season fruit. Sometimes there was one fruit that I stocked up on, and other weeks it seemed like everything was at the lowest price all at once. The Nectarine-Lime is one of my new favorites. It is so refreshing! Definitely one I will make every year. One of the reasons I like working with nectarines is the fact that they don't need to be peeled first. I hate peeling fruit. 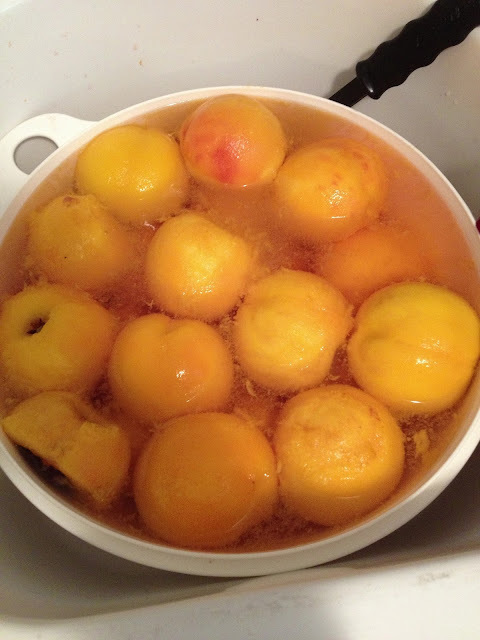 But on the day I had to process the peaches (and it turned out that I bought way too many peaches!) Lyndsay was home, and offered to do it for me! 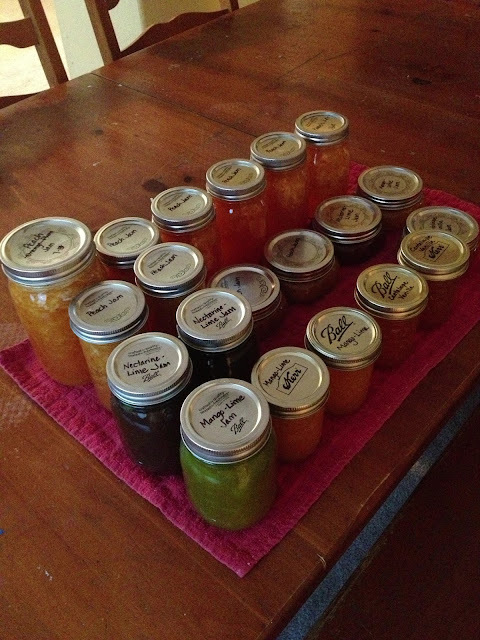 Since jam has to be made in small batches, it took three batches of jam to use all the peaches. This was the day I had dedicated to jamming. I had fruit overflowing everywhere that had to get processed. It was much easier that the peaches were freestone, instead of clingstone. Dicing them up was a breeze. I thought it fascinating to find a few of the pits cracked open with the seed inside. 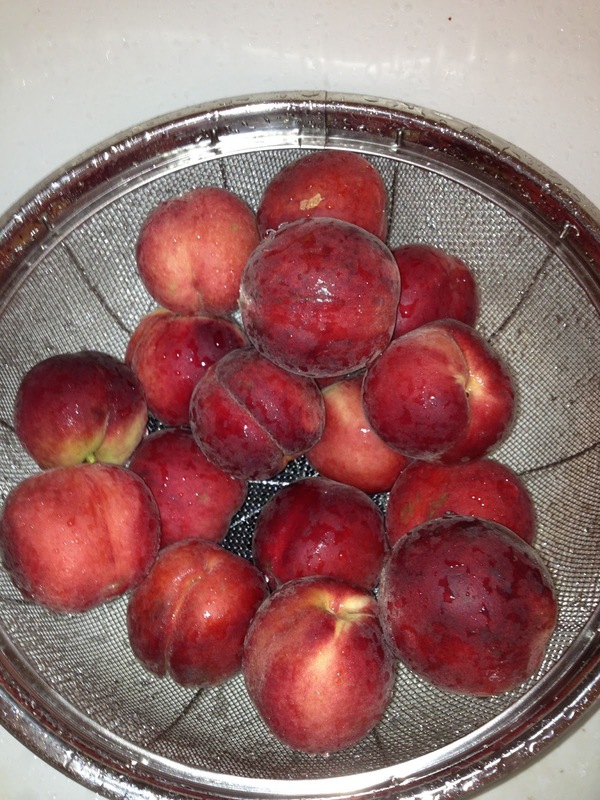 Both peaches and almonds belong to the Rosaceae family, and the seed inside definitely gave that away. 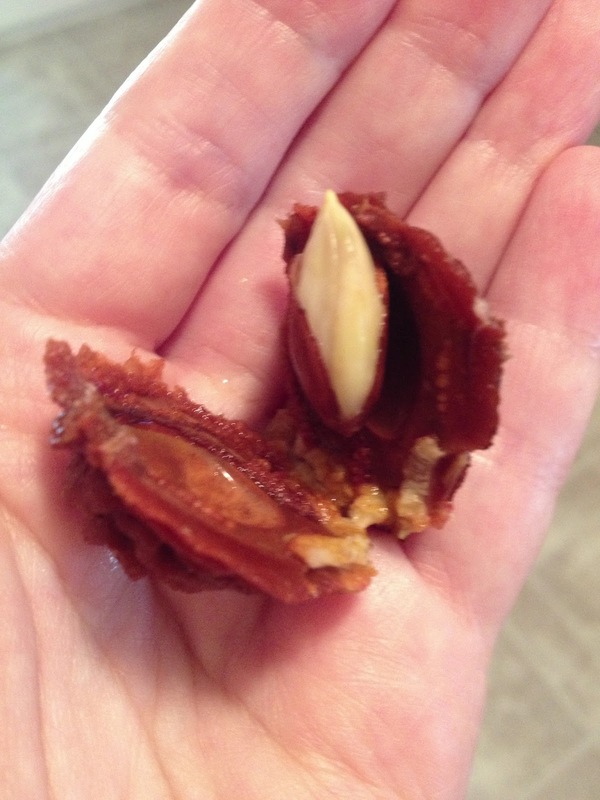 It looked just like an almond, splitting out of its skin. Here are the three batches of Peach Jam I made that day. 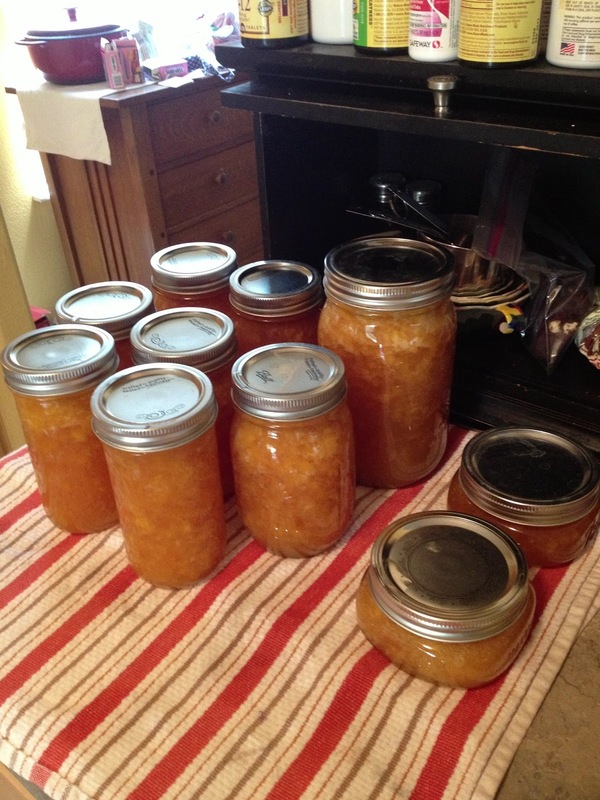 I'd already made a previous batch two weeks earlier, so we definitely are set with Peach! 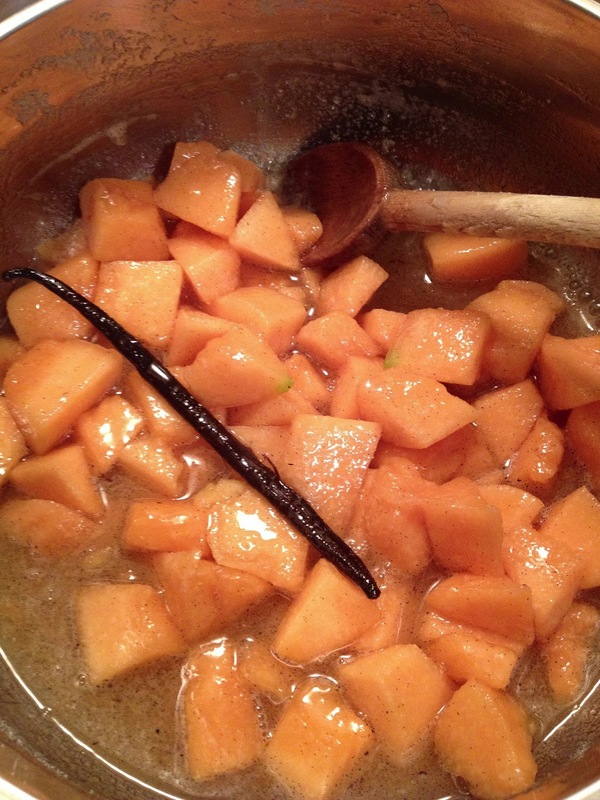 This was a new surprise, though: Cantaloupe-Vanilla Jam! 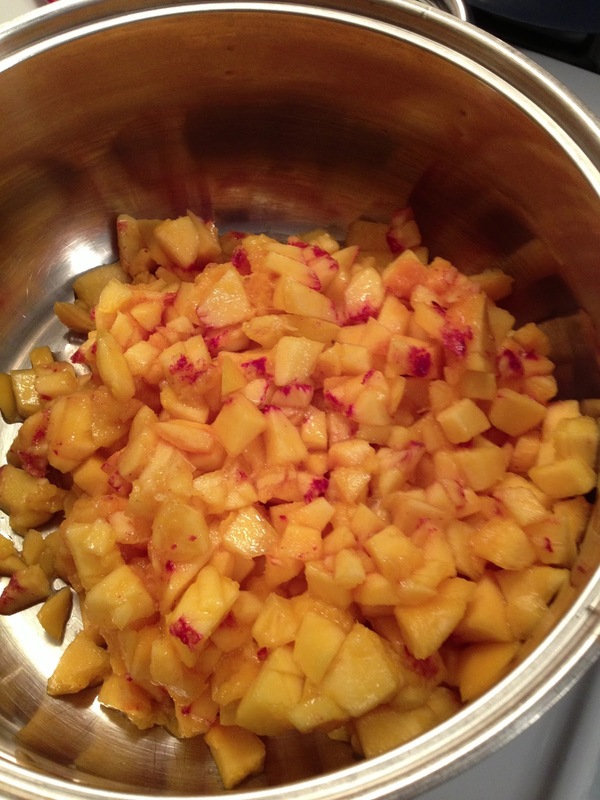 I never knew cantaloupe could be made into jam, but it is incredible! Like the cookbook says, it's reminiscent of the most exotic creamsicle. This makes a very tiny batch (3 half-pints). So, so good! After about six hours of jamming, the kitchen was sticky! 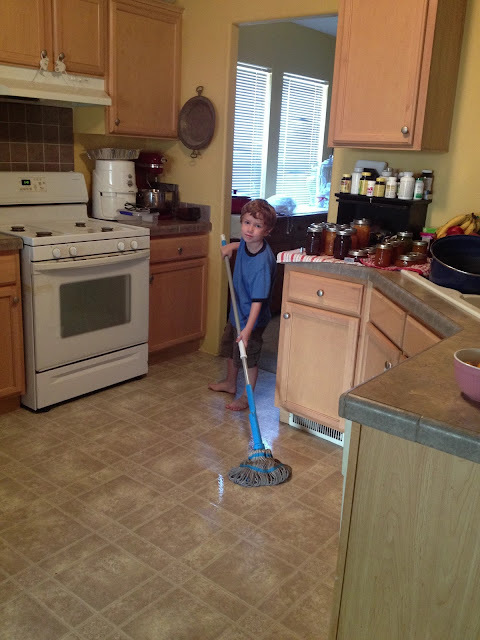 I try to be very diligent about cleaning as I go, and I had a good system down for clean-up and prep in between batches (we made 6 batches that day), but at the end, I scrubbed down the stovetop, tossed the burner grates into the dishwasher, and put Conor to work mopping the splatters from the floor. 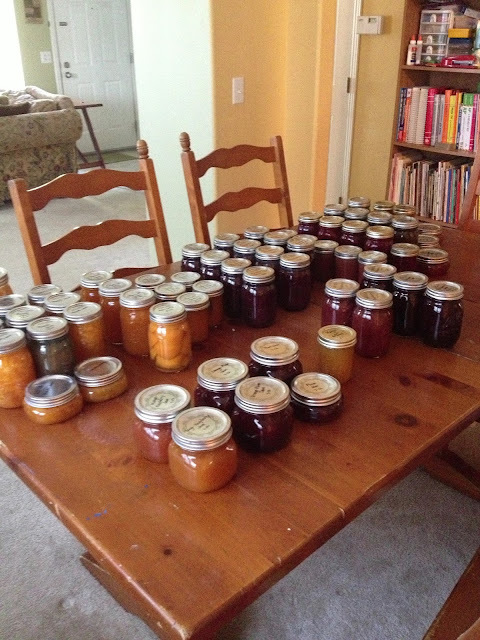 And the next day, I thought, "I'd better pull out all the jam I've done this summer to see how we're doing." Turns out, I think we're good. 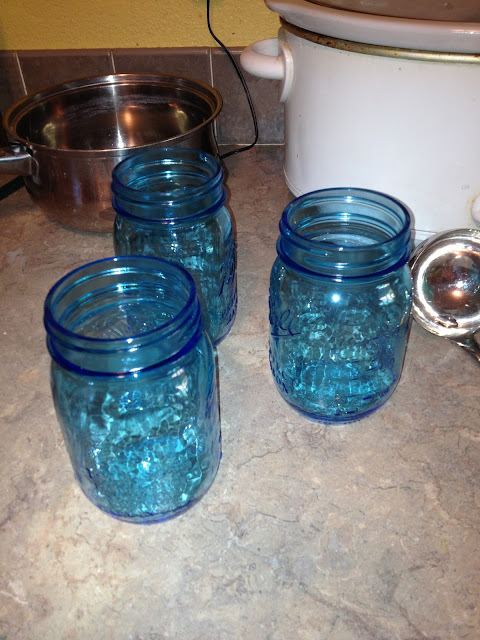 And here's a picture with the few remaining jars from last year, which thankfully, are all flavors I didn't make this year, so they just add to our variety! 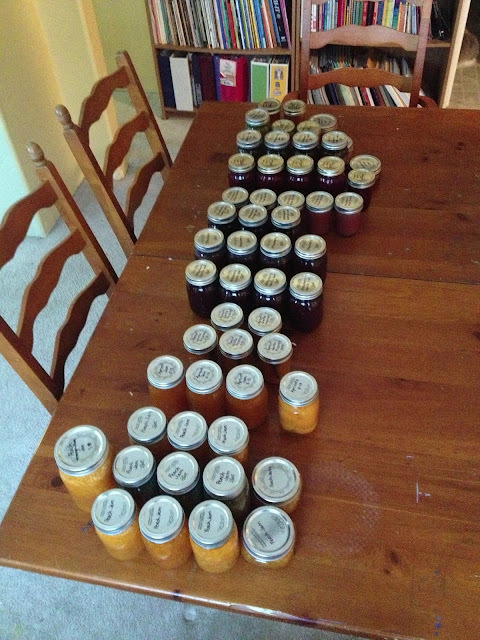 Yes, I think there's plenty of jam to last the year, with enough to share. 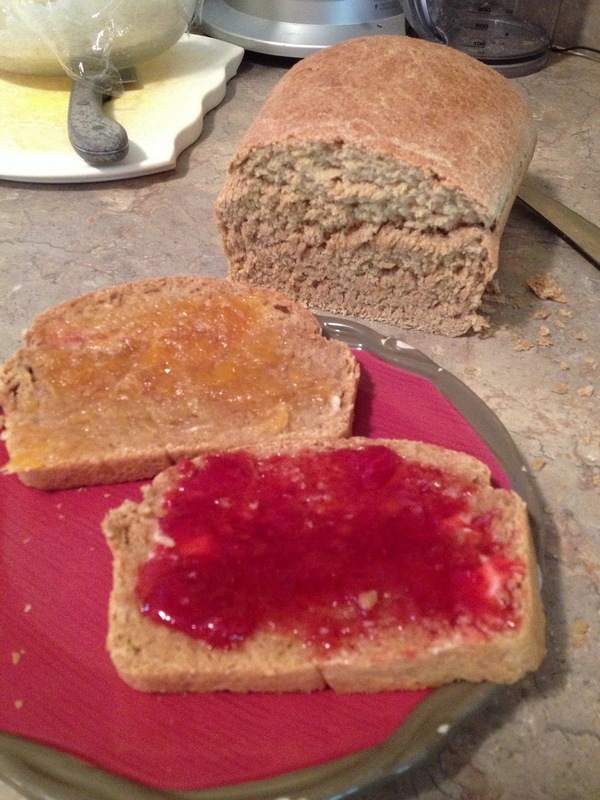 The next morning, we baked some loaves of whole wheat bread and got to tasting it all!